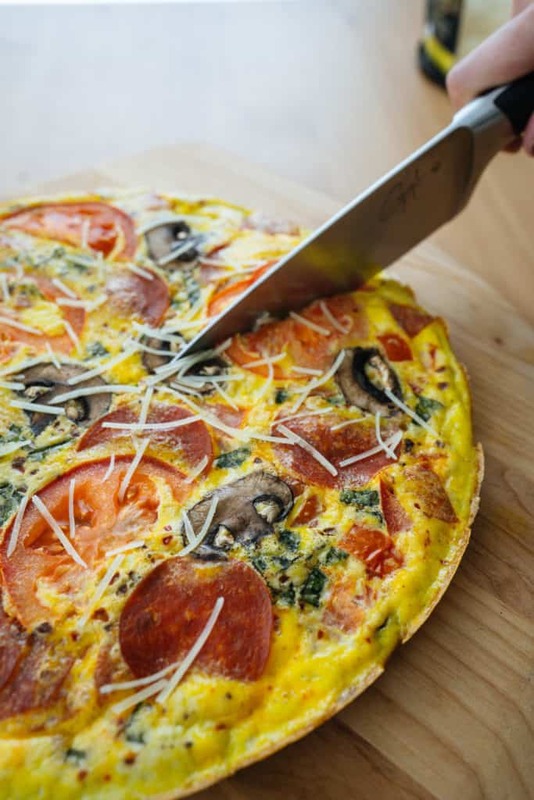 Pepperoni Pizza Frittata | 30 Minute Meal! 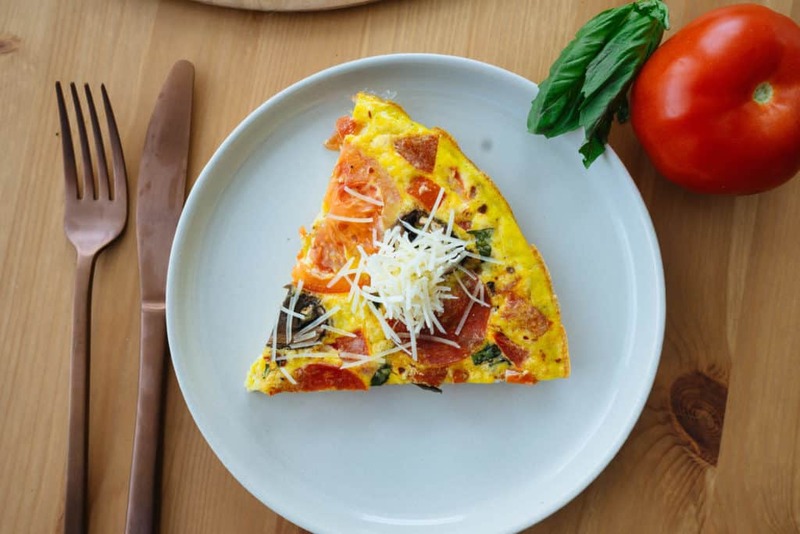 We're not all breakfast people, but for those of us who love it this Pepperoni Pizza Frittata is especially for you! As you can see from the video and the recipe we went pretty basic with our add ins, keeping it simple for a quick and healthy start. However, as you know, pizza comes topped with anything and everything these days so feel free to add in some chicken and buffalo sauce, or ground beef and taco seasoning and top it off with some lettuce! You can never go wrong with a pizza frittata. Our Favorite, Easy Frittata Recipe! We should really say this is one of our favorite meals. Not only is it packed with good fat and protein from the eggs, but it's filling and really easy to throw together in one skillet and make in under 30 minutes. We often make frittatas or casseroles, such as our broccoli and sausage casserole, for meal prep all week. It will stay fresh up to seven days in a sealed container and you can change up the add ins you use every week or even just toss in leftovers so there is no waste! This frittata recipe re-purposed some leftover pepperoni and veggies we had giving us the perfect breakfast! When we find time to start our day off with a breakfast, we like to keep it as low carb as possible. We prefer to consume most of our carbs either during lunch after a workout or for dinner! With this low carb pizza frittata you're not only keeping your carbs really low, but your packing in a lot of fat and protein to keep you full until your next meal or throughout a strenuous work out! Some other great options are our macro muffins and breakfast bowl! We can't recommend frittatas enough and we always suggest turning to these for meal prep if you're short on ingredients or need something quick! You can have fun with the ingredients or keep it simple with one veggie and one meat. We like to change up the ingredients week to week and top it with cheese when re-heating. 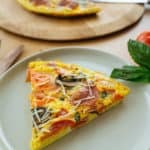 If you haven't had a frittata recently or ever before, we highly encourage you to make this low carb pizza frittata for your next family breakfast or pizza night! Recipe can be quickly added to MyFitnessPal - Search "KetoConnect - Pepperoni Pizza Frittata"
Set aside 1/2 oz pepperoni and roughly chop up the remaining pepperoni (1oz) and all the basil. Set aside in a bowl. Make 3-4 slices off the tomato lengthwise and chop the remaining tomato into small chunks. If desired, slice the mushroom lengthwise into thin slices (optional for topping). Crack the eggs in a large mixing bowl, add the salt, oregano, red pepper flakes and black pepper and whisk to combine. Add in the chopped up pepperoni, basil, and tomato chunks (leaving the 1/2 oz pepperoni, and tomato and mushroom slices aside). Add in the cheese and whisk to combine. Heat a large (12 inch) skillet to medium high heat. Once hot pour in the egg mixture and allow to cook for 2-3 minutes until you can scrape a spatula along the edges. If the eggs start to bubble, turn the heat down to medium. Once the edges have cooked and slightly pulled away lay on the slices of pepperoni, tomato and mushrooms, and place in the oven. Bake for 15-20 minutes (time varies oven to oven). Enjoy! Store in a zip top bag or sealed container up to 1 week.